Hi everyone my name is Chauncey Yarderer the DIY Master Gardener. I'm a guest author and contributor here at DIY Answer Guy. I'll be here to answer your DIY gardening and landscaping questions, as well as recommending time and body saving products for all your gardening needs. Since gardening is not only my business but my passion, I believe I can help you with such things as landscape and garden plant selection, insect/animal control, pruning, general design ideas and give you some of my tried and true DIY gardening tips for easier maintenance. I look forward to working with you to create a wonderful natural environment in your world. See you in the garden. Now here are some of the essential gardening tools that any landscaper or home gardener should own. Also, if you're looking for a great gift for your special DIY'er, any one of these will surely do the trick. 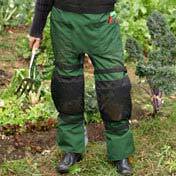 Worn by professional landscapers, farmers and gardeners these heavy-duty 1000 denier textured nylon chaps with built in knee pads are the best you'll ever own. They go on and off easily and quickly over pants and boots. And, the knee pads won't cut off your circulation. Save your knees and clothing now. The gardener's new best friend is the Hori Hori knife. Great for weeding, planting and even cutting sod. It has a stainless steel blade that is serrated on one side and a hard wood handle for durability and long life. I've all but given up all my trowels and weeders, and I couldn't be happier. This is the one tool that will surely make your gardening life easier. Beware of impostors, Grow Tech makes the best quality.